Sweet Basil (ocimum basilicum) The Pagans called it ‘Witches Herb’. This herb is associated with the Element Fire and the Planet Mars. It provides its user with love, protection and wealth. 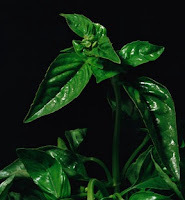 The scent of fresh basil causes sympathy between two people, this is why it is used to smooth tempers between lovers. Hindus grow this herb to provide protection for the home and family. Basil has been used to attract customers to a business by placing on the doorsill. It is an Indian Herb introduced to Europe and is best used fresh for the strongest effect. Basil is great as a salad addition, sprinkled on omelets, rubbed with lemon into fish or poultry before grilling, or in a classic pasta sauce. Good in a wide variety of spreads, a simple example is one teaspoon chopped fresh basil in one cup mayonnaise makes a fresh taste on a sandwich. Planting basil brings protection and good fortune. Basil is a cold sensitive herb, which originated in the warm humid tropics. It likes full sun and needs plenty of space. Basil is an annual herb and reseeds itself before the end of each season. Harvest leaves weekly, pinching terminal buds first to encourage branching. Some say basil is best preserved chopped and frozen, but it also keeps well in glass jars covered with olive oil. For use: Shake well; cover eyes and mist above your hair, body, and clothing for outdoor fun with less buzz. It’s safe to spray mist on fabrics, skin, dogs, and horses.